In January this year I took over management of the IT Services coffee fund. As anyone who works in the industry will know, ensuring a steady, uninterrupted supply of coffee is essential to the smooth running of any IT Department. At its most basic it involves collecting money and using that to buy tea, coffee, milk, sweetener and sugar but things are never that simple! Providing choice – or at least the illusion of it – is important; members need to feel they’re getting good value from their £5 per month and it’s very important to make sure supplies don’t run out! I’m still working on that last problem but value for money is certainly improving. The fridge in the new IT Services office is bigger (and more reliable) than the last one allowing bulk purchase of milk while greater cupboard space in the kitchen allows storage of supplies of sugar and coffee, reducing likelihood of running out. The final problem of providing choice opens a can of worms. Obviously we need to provide the choice of tea and coffee but how much further do we go? We provide the choice of ground and instant coffee but even then everyone has their own views. Being a bit of a stats geek this provides endless opportunity for analysis of what we buy but that will have to wait for another time! 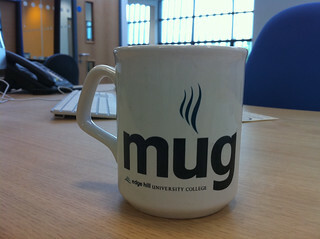 The photo above is from 125 by 125 – a blog commemorating the 125th anniversary of Edge Hill University.